Two strangers take part in a psychological experiment on intimacy in the era of social media. Hildy and Paul are total strangers who both happen to take part in a local university study for the princely sum of $40. The study centers on the titular 36 questions, a series of (real-life) inquiries that are designed to engineer affection between two partners. Circumstances prevent the pair from finishing the assignment in one sitting, but over the course of several days, the two straight, white teens engage in an online back and forth that eventually completes the questionnaire. The questions chip away at Paul’s and Hildy’s reservations, and the two eventually reveal home lives fraught with emotional abandonment and dishonesty. 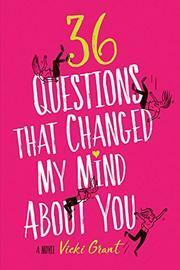 The concept of the 36 questions is a clever enough line to hang the burgeoning romance upon, but the novel is far too long. There’s a lot of repetition here, and while Hildy and Paul feel real enough to fall for each other and engage readers, they lack the full three dimensions this book’s length needs to work. The story also suffers from late reveals that are telegraphed and hinted at and drawn out so extensively that any emotional effect these reveals have is long gone. The secondary characters are well-conceived, Hildy’s parents and friends thematically and structurally underlining the primary romantic argument for honesty and emotional availability.